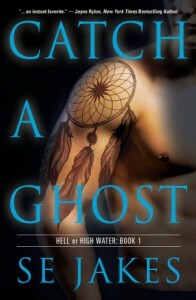 I received Catch a Ghost in exchange for a fair and honest review. Definitely a 4 1/2 Star rating....Oh wow… I don’t even know where to begin. Prophet and Tom have just turned into two of my favorite characters and SE Jakes has a brand new fan. Yep, Catch a Ghost was that good.This was definitely a character driven story. It would be impossible to read this and not feel something for someone. Even the supporting characters were strong, but front and center were always Prophet and Tom. The POV switched between the two and it worked well in this story. Although the ghosts in the description were Prophet’s, Tom had some of his own. These men were both broken and they were good at shielding themselves, especially their hearts.I loved the strength of these two men as much as their vulnerability. I loved Tom’s determination to get through Prophet’s wall. I loved Prophet’s sense of loyalty and the cranky, non-caring vibe that he threw off and the way Tom could see right through it…. sometimes. Neither one of these men were perfect, far from it. That was also the main reason why they were perfect for each other.Beyond what was going on between Tom and Prophet was a very intriguing story. There was a mystery that wasn’t predictable. There was danger, action and more than a few twists and turns. It was definitely a page turner… yet I didn’t want it to end….Speaking of endings. Yikes! This was one of those books where you hope and pray you didn’t just reach the end. Yeah, I know. Authors are evil and I knew going in that this was going to be a series, but still. Thankfully Book 2 in the Hell or High Water series, Long Time Gone, comes out in October of 2013. Needless to say, it’s already on my TBR list.